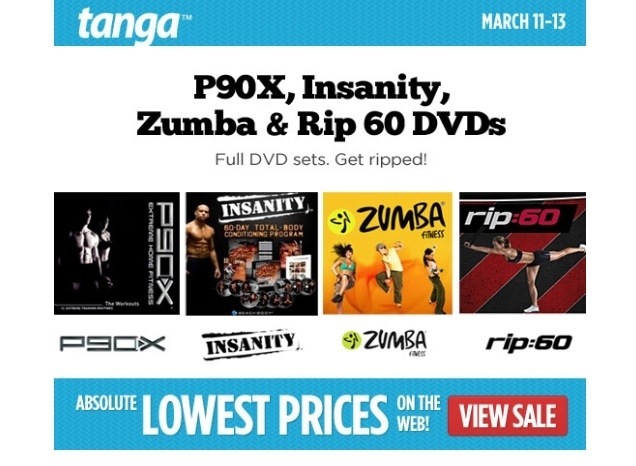 Tanga has an amazing 48 hour sale on workout DVDs ending midnight 3.13.13. You can purchase P90X for $59.99, P90X2 for $73.99, Zumba for $49.99, Rip 60 for $79.99, and Insanity for $59.99 with free shipping. These deals are awesome! My husband and I have P90X and Insanity and paid quite a bit more on eBay, thinking we got a good deal. Click here to get these fabulous work out DVDs!